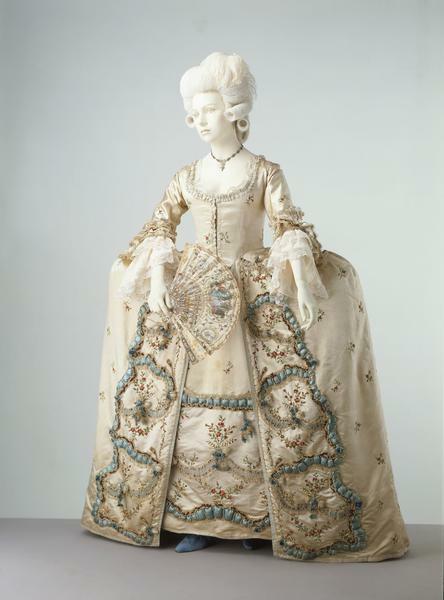 This is an example of the most formal ensemble for a woman in the late 1770s, except for court dress. 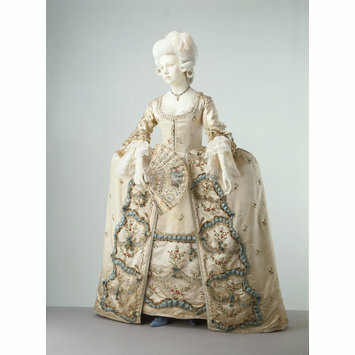 It is a robe à la française (sack), worn over square hoops and very elaborately decorated. Feathers, lace, raffia tassels and lengths of satin embellish an already embroidered satin. The pale colours, small floral motifs and light application of the decorations show that the influence of the Rococo style was beginning to wane. The petticoat is made of 3 widths of silk, pleated at the waist and decorated in the same manner as the sack. Both garments were altered for fancy dress in the late 19th century. 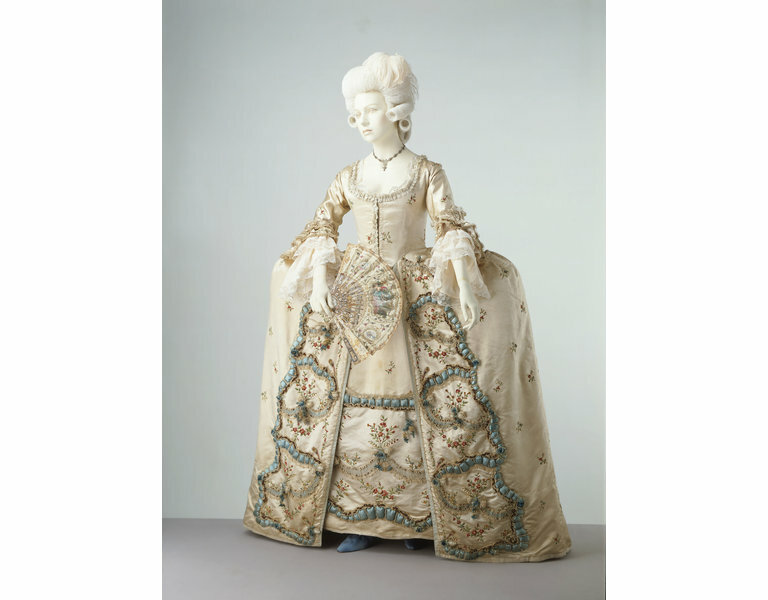 Darts (now unpicked) were made in the bodice fronts, and the white taffeta ruching around the neck was probably added then. Hooks, eyes and whalebone strips were added to the bodice fronts. The waist pleating of the petticoat was unpicked to lengthen it and 3 panels of the petticoat back were removed. These have been reconstructed for museum display. Parallels to this rich melange can be found among the sample embroideries at the Musee des Tissus in Lyon (nos B.874, 878, 880). In the engraving 'Les Adieux', J.M. Moreau le Jeune shows a dress of similar cut and style of decoration. Natalie Rothstein, Four Hundred Years of Fashion (V&A Publications, 1984), p. 126.